Tax knowledge is considered to be the most important factor when choosing a financial advisor, according to a new survey, which also found the CPA credential to be the one most associated with financial advice. The survey, from 1st Global, a wealth management firm that works with CPAs, found that 66 percent of affluent and emerging affluent consumers view tax knowledge as the most important factor when choosing a financial advisor. In addition, 47 percent of the respondents associated the CPA designation with financial advice, the largest of any designation included in the study. For the study, 1st Global and PopResearch polled 300 respondents with $150,000 or more in assets. The report, “Investors, CPAs and Tax-Focused Financial Advice,” found that even though 53 percent of the survey respondents currently work with a CPA or accountant, tax-aware advice is still a key concern for them. 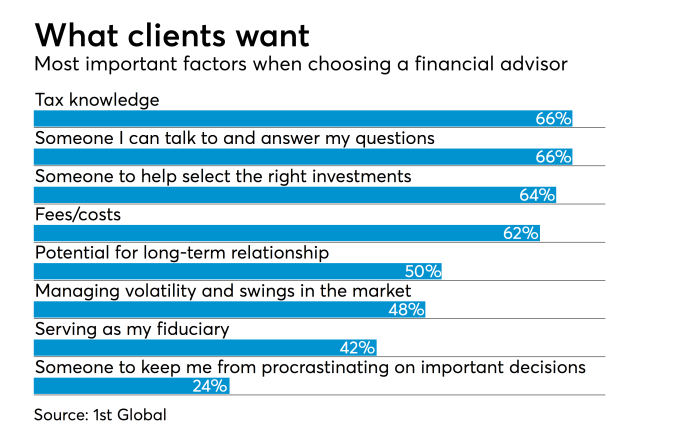 Tax-optimized investing (58 percent), estate tax planning (45 percent) and tax burden reduction (45 percent) ranked as the top three specialties the investors who were surveyed said they seek when choosing a financial advisor. Trust was considered to be more important to investors than skills or knowledge, with 90 percent of the survey respondents defining a trusted advisor as someone who had their best interest in mind. Only 10 percent named skills or knowledge as important. Despite growing access to digital interactions and information, face-to-face discussions continued to be important to the survey respondents, with 57 percent ranking face-to-face interactions as very or extremely important to them. “Well more than half of the survey’s respondents felt like it was either very or extremely important to meet face to face with the person giving them advice,” said Knoch. The majority of respondents indicated they would discuss investments and long-term financial aspirations with their CPA or accountant, and 74 percent said they were somewhat or extremely comfortable doing that. The survey also revealed some generational differences, with younger generations seeking financial advice from professionals more than Baby Boomers. More than 60 percent of respondents in Generation X and Generation Y said they have a CPA and a financial advisor. In addition, younger respondents with a CPA were 6 percent more satisfied with their financial advisors. Many investors are looking for tax-optimized investing strategies, especially in the wake of the new tax law, although the survey didn’t ask specifically about the Tax Cuts and Jobs Act. But there’s more opportunity for CPAs to offer such services in the context of the tax overhaul.